Keswick is one of the most visited places in Cumbria. It is the most northerly of the towns in the core of the Lake District, lying just south of the main east-west A66 trunk road close to Derwentwater. Bassenthwaite Lake, the northernmost of the major lakes, is just about three miles away, separated from Derwentwater by a stretch of low-lying ground which in past centuries used to be prone to flooding. The town was awarded its charter as a market town by Edward I. Over the centuries it has also had an industrial history with textiles, lead mining and pencil manufacture at its heart. Pencils are still made in the town, although nowadays using imported rather than the local graphite discovered at nearby Seathwaite in 1565 and thought then to be a form of lead (hence the term “lead” for the graphite core of pencils). The Cumberland Pencil Company has a pencil museum. The history of the pencil is described in fascinating detail through special displays at their Derwent Factory in Keswick, which has been in operation since 1832. I well remember passing a set of blue trailers being assembled together in the middle of Burnley (in East Lancashire) when I was a boy at Burnley Grammar School in the 1950s. The traveling “Century Theatre Company” was visiting the town and set themselves up on the open ground behind the Odeon Cinema, where the Sainsbury supermarket is now. It stuck in my mind and in later years that memory was repeatedly revived by the sight of the Blue Boxes near the lake at Keswick, where they were located after 1975 in their “retirement” from traveling. They’re no longer to be seen there, however, having in 1999 been replaced by the splendid new 400-seat “Theatre by the Lake“. (The Blue Boxes have now gone home to Leicestershire, providing accommodation for a community theatre at the Snibston Discovery Park on the site of the former Snibston mine in Coalville, not far from Hinckley where the trailers were originally constructed). “The Keswick School” was founded in 1884 by Canon Rawnsley, the vicar of St. Kentigern’s Church, Keswick. Rawnsley was also founder of the National Trust. Like others at that time he had become concerned at the replacement of human craft skill by what was all too often (although not inevitably) the inhumanity of machine-based industry. The school both provided classes in which students could learn the skills of working in copper, silver and brass. It also employed craftsmen on a full-time basis to produce high quality items for sale, reflecting the values of the Arts and Crafts movement so strongly associated with John Ruskin who had settled at Brantwood, by Coniston, and was a friend of Rawnsley. KSIA (to use the letters of the mark stamped on its products) went through various ups and downs as the years progressed. It had to respond to economic reality in order to survive. For example, in the first world war a major product was memorial plaques. Then stainless steel was added to its range of metals worked. Eventually it had to bow to the ultimate economic reality, and closed its doors in 1984, having survived for just one hundred years. 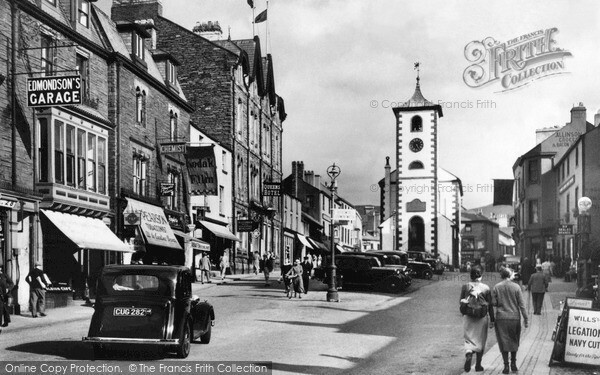 The Keswick Museum & Art Gallery houses a collection of Keswick School products; the museum web site also has a downloadable 7-page brief history, and the Cumbria County Counil archives Department holds the KSIA records. See also The Loving Eye and Skilful Hand: The Keswick School of Industrial Art by Ian Bruce, 2001. Since 1875 Keswick has also been home to the world-famous Keswick Convention, an annual gathering bringing together thousands of Christians from many different denominations. In an era when barriers between Christian denominations were still high (although often related more to organisational and leadership practices than to serious differences over the articles of the Christian faith) “Keswick” was to become a major unifying force among Bible-believing Christians. The first convention, attended by about three hundred people, was organised in a tent on his lawn by Canon Harford-Battersby, the then vicar of St. John’s, Keswick. Early leaders included Handley Moule (who was to become Bishop of Durham from 1901-1920) and the eminent Baptist preacher and writer, F. B. Meyer. The Convention drew on St. Paul’s words as a slogan of unity, “All one in Christ Jesus”, and focused on a call for practical holiness in daily living It continues to the present time, occupying three weeks in the summer holiday season, and the “Keswick” model has been widely copied around the world. You certainly can’t travel by train to Keswick now. The line was closed in 1972. You’ll probably arrive via the M6 motorway and the A66. However, for almost a century what started out as the Cockermouth, Keswick & Penrith Railway (before being merged into the London, Midland & Scottish Railway) ran both goods and passenger services connecting with the mainline trains at Penrith. We have a separate page on this piece of history (By Train to Keswick) and even a suggestion that the line may be resurrected. Keswick is an excellent centre for visiting many areas of the Lake District. Immediately by the town is Derwentwater, and Bassenthwaite Lake is just three or four miles away. 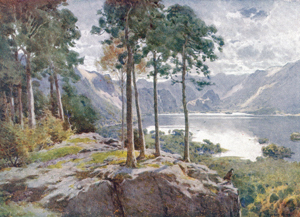 To the east, Ullswater is easily reached. Conveniently to the West are Buttermere, Crummock Water and Loweswater and also the town of Cockermouth with Wordsworth’s birthplace. To the south down St. John’s Vale, past Thirlmere and over Dunmail Raise lies Grasmere, also with its strong Wordsworth connections including Dove Cottage. Hotels In and Near Keswick.